Leupold 58550 FX-II 4x33mm Wide Duplex Reticle Riflescope FREE SHIPPING! The Leupold FX-II 4x33mm Wide Duplex Reticle Riflescope is a fixed power scope designed to provide hunters and shooters with premium performance. Its large exit pupil maximizes light transmission to the eye, and its multi-coated four-lens optical system delivers exceptional clarity and contrast even in low light. Easily adjustable windage and elevation controls provide precise aim for accurate shooting at long distances. The extended eye relief means that you can mount the scope ahead of the receiver if needed for additional versatility. Its rugged tube is completely waterproof, allowing you to use your scope in any weather conditions, and features a wear-resistant finish. The scope also comes with a custom-fitted scope cover for protection while not in use. 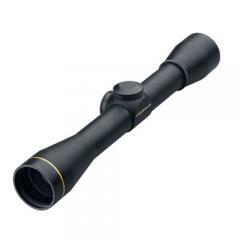 ©2002-2019 CopsPlus.com: Leupold 58550 FX-II 4x33mm Wide Duplex Reticle Riflescope FREE SHIPPING!